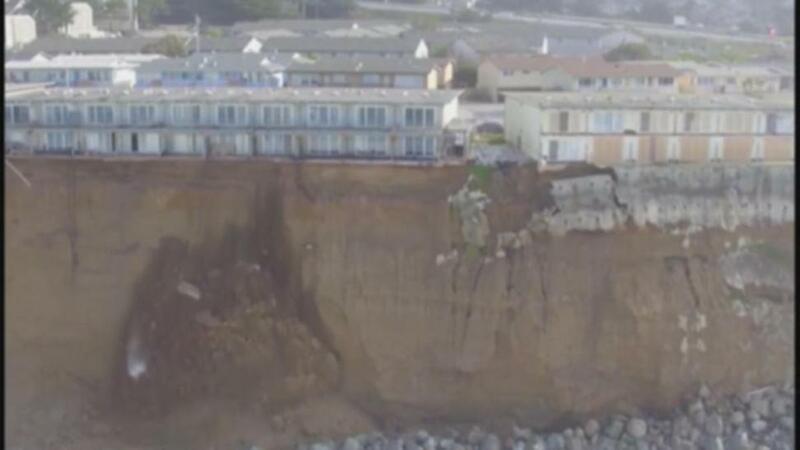 A week after Pacifica demolished an apartment on a crumbling cliff, city leaders are asking a safety commission to reject an appeal by residents who want to overturn a decision to yellow-tag the property after geologists have cited a “clear danger” because of the continuous erosion there. On Tuesday, Pacifica called on the Pacifica Emergency Preparedness and Safety Commission to uphold the mandatory evacuation of the apartments at 310 Esplanade Ave. to "protect resident safety." Last week, city crews took down the neighboring apartment complex at 320 Esplanade. Pacifica Chief Building Official Mike Cully “yellow tagged” the apartments at 310 Esplanade Ave. on Jan. 25, and declared the structures uninhabitable after El Nino-related storms caused wave-driven erosion of the nearby bluffs. A yellow-tag designation means residents are allowed to access the buildings only to remove belongings. The Pacifica Emergency Preparedness and Safety Commission on Wednesday will consider an appeal by some of the tenants who want to remove the yellow tags on their old units. If the commission sides with the tenants, the city said it will start a new yellow-tag process. If the commission agrees with the city, the tenants' only recours would be to sue. Gordon King, who has lived in the complex for 15 years, is one of the tenants who want the city to reverse its decision. The 74-year-old retired veteran is working with Pacifica Resource Center to find housing. King said he has spent much of his fixed income on motels and no one will accept his VA housing voucher. "The stress point is amazing," King said. "I never thought it was possible that your life could change in one day, and it really can." Of the households displaced, 14 have found permanent housing, Pacifica leaders said. The city has also sought outside funding for financial aid to assist evacuees. To date, San Mateo County has committed about $20,000 through Measure A sales tax for security deposits, rent assistance and to help cover motel stays as residents search for new housing. Several residents with Housing Authority vouchers are also being helped by Abode Services. The Linda Mar Safeway has also provided $2,500 in gift cards to displaced residents of 310 Esplanade Ave. and a Pacifica Winter Storms fund has been set up online and continues to accept donations to provide further assistance. City officials say the appeal filed by Millard Tong, the owner of 310 Esplanade Ave. and the recently demolished 320 Esplanade, Bart Willoughby, a former building resident, and several others ignores years of warnings by the city regarding the bluff’s progressive erosion and disregards the findings of a geotechnical expert, officials said. This is not the first of Tong’s buildings evacuated due to coastal erosion. In 2010, Pacifica evacuated and “red-tagged” the 20-unit apartment building at 320 Esplanade after storm-driven coastal erosion rendered it similarly unliveable. In July 2015, the city initiated code enforcement action against Tong related to the poor condition of 320 Esplanade. A few months later, in October 2015, the city filed a criminal misdemeanor complaint for violations of the Pacifica Municipal Code related to the condition of 320 Esplanade. On Feb. 23, Tong pleaded no contest to two charges and was sentenced to three years probation and ordered to cooperate with the city’s efforts to abate the dangerous conditions at 320 Esplanade and pay full restitution for the costs of that abatement. Meanwhile, Tong filed for bankruptcy in March 2015. The city is participating in the case in an effort to monitor available assets and recover any costs incurred at 320 Esplanade, including the cost of last week’s demolition.